IC 2560 is a barred spiral galaxy with a diameter of about 121,000 by 78,000 light-years, located over 110 million light-years away from Earth in the southern constellation of Antlia (the Air Pump). It is speeding away from us at approximately 2925 kilometers per second. The constellation of Antlia was originally named antlia pneumatica by French astronomer Abbé Nicolas Louis de Lacaille, in honor of the invention of the air pump in the 17th century. However, IC 2560 is a relatively nearby spiral galaxy, and it is easy to spot its spiral arms, its dark dust lanes and barred structure in this image. This galaxy is part of the Antlia Cluster, a group of over 200 galaxies held together by gravity. The Antlia cluster is unusual; unlike most other galaxy clusters, it appears to have no dominant galaxy within it. 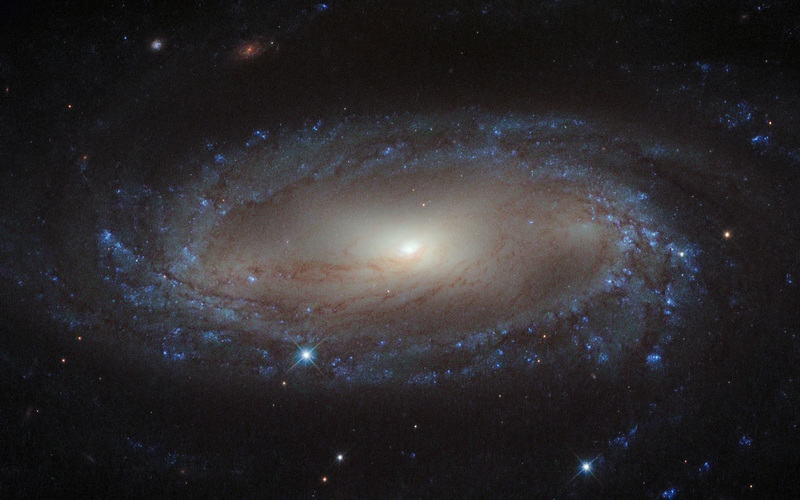 IC 2560 is classified as a Seyfert II galaxy, a kind of spiral galaxy characterized by an extremely bright nucleus and very strong emission lines from certain elements, such as hydrogen, helium, nitrogen, and oxygen. The centers of Seyfert galaxies have active galactic nuclei (AGN), and usually contain supermassive black holes with masses between 10 and 100 million solar masses. Seyferts are classified as Type I or II, depending upon whether the spectra show both narrow and broad emission lines (Type I), or only narrow lines (Type II). Indeed, the bright center of IC 2560 is thought to be caused by the ejection of huge amounts of super-hot gas from the region around a central black hole. This image is taken with the Wide Field Planetary Camera 3 onboard the Hubble Space Telescope using an infrared, an optical and an ultraviolet filter. A version of this image was entered into the Hubble’s Hidden Treasures image processing competition by contestant Nick Rose.